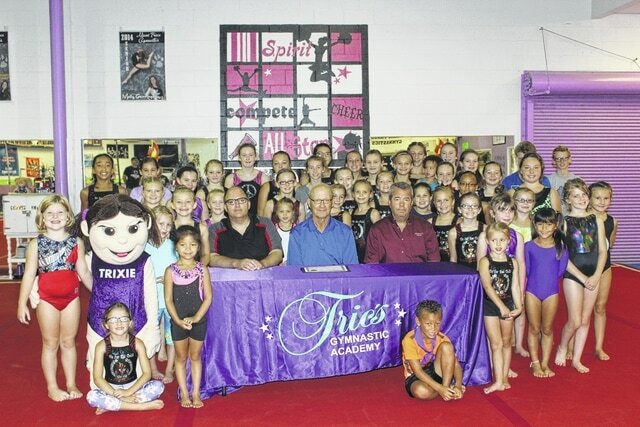 City Manager Joe Denen, City Council Chairman Dale Lynch and Fayette County Commissioner Tony Anderson recently visited Trics Gymnastics Academy, in Washington Court House, to explore the facility and celebrate National Gymnastic Day with the athletes there. The facility is owned by Mark and Susan Holloway, who are also the main coaches at their gym. Athletes of all ages and backgrounds participated Saturday in various exercises. The City of Washington Court House recognized Sept. 17 as National Gymnastics Day and celebrated with a tour of Trics Gymnastics Academy. City Manager Joe Denen, City Council Chairman Dale Lynch and Fayette County Commissioner Tony Anderson recently visited Trics in Washington C.H. to explore the facility and celebrate National Gymnastics Day with the athletes there. The facility is owned by Mark and Susan Holloway, who are also the main coaches at their gym. According to their website, Susan has been a coach for over 28 years and began her love of the sport when she was in the seventh grade. Susan competed in gymnastics both at her local Y.M.C.A. and high school. She graduated from Miami Trace High School and earned her bachelor and master’s degrees from Wright State University. She recently retired from the health and physical education teacher position at her alma mater (30 years). Susan has been at the varsity helm of softball (five years), volleyball (15 years), and gymnastics (19 years). She has also coached basketball (two years). Mark also graduated from Miami Trace High School. He earned his associate of arts degree from Southern State University. He has been employed with Intelligrated for 34 years. Mark is the purchasing supervisor for the company. Being behind the scenes aiding his wife throughout the years, Mark has an incredible knowledge of the sport. He has coached volleyball (seven years) and been with the high school gymnastic program all 19 years. Both Mark and Susan enjoy participating in competitive volleyball and playing tennis in their free time. For more information on Trics Gymnastics Academy call (740) 335-8742.
https://www.recordherald.com/wp-content/uploads/sites/27/2016/09/web1_IMG_0974.jpgCity Manager Joe Denen, City Council Chairman Dale Lynch and Fayette County Commissioner Tony Anderson recently visited Trics Gymnastics Academy, in Washington Court House, to explore the facility and celebrate National Gymnastic Day with the athletes there. The facility is owned by Mark and Susan Holloway, who are also the main coaches at their gym. https://www.recordherald.com/wp-content/uploads/sites/27/2016/09/web1_IMG_0962.jpgAthletes of all ages and backgrounds participated Saturday in various exercises.